Home > Textbooks > History of Ancient Greece. New York, NY W.W. Norton & Co, 1968. 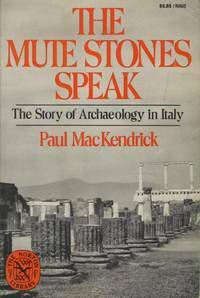 Paperback First Edition Thus (1968), Second Printing. Very Good+ to Near Fine in Wraps: shows indications of very careful use: just a touch of wear to the extremities; mild rubbing to the wrapper covers; a partially removed price sticker at the upper corner of the front panel; a barely discernible crease at the backstrip; the binding is square and secure; the text is clean. Free of underlining, hi-lighting, notations, or marginalia. Free of creased or dog-eared pages in the text. Free of any ownership names, dates, addresses, notations, inscriptions, stamps, plates, or labels. A handsome nearly-new copy, structurally sound and tightly bound. Remains close to 'As New'. NOT a Remainder, Book-Club, or Ex-Library. 8vo. (7.75 x 5 x 0.8 inches). viii, 342 pages. Revised by André Aymard. Translated by A.C. Harrison. Edited by E.H. Goddard. Language: English. Weight: 11.4 ounces. First Edition Thus (1968), Second Printing. Trade Paperback. 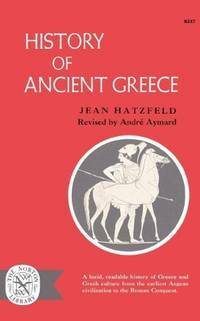 Title: History of Ancient Greece. Edition: First Edition Thus (1968), Second Printing.